The Knights of Columbus is the world’s largest Catholic family fraternal service organization with 1.6 million members. It provides members and their families with volunteer opportunities in service to the Catholic Church, their communities, families and young people. As a member of the Knights of Columbus you and your family enjoy many benefits, including 12 free issues annually of the Columbia magazine, the world’s largest Catholic family magazine, eligibility to join the Knights of Columbus top-ranked life insurance program, and many more family and personal benefits. We, the Knights of Immaculate Conception are deeply involved in the parish community. In particular, we have served breakfasts and dinners to bring all of the community together and have had a special devotion to the Eucharistic Adoration held monthly in the parish Chapel. 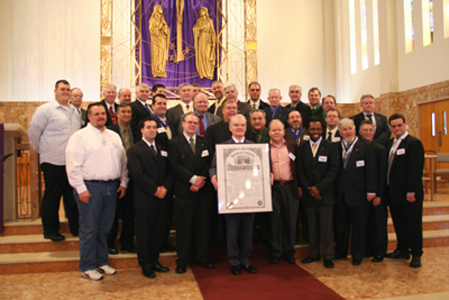 We were chartered on March 5, 2006 as seen in the photo above. Men interested in joining the Knights at Immaculate Conception in Malden may contact the Membership Director, Tom Monahan, directly. Tom’s photo and phone can be found on the Officers’ page.